Hello there, Gameologeritos, and welcome to our weekly thread for the discussion of weekend gaming plans and recent gaming glories. Most of my time will be dedicated to polishing off Resident Evil 7; you can find the first part of my review right over here. I’m close to the end, though, and I’d like to have something else lined up for when it’s done. From everything I’ve seen and read over the past week, Yakuza 0 has to be the frontrunner. I’ve been fascinated by Sega’s deeply Japanese crime operas/goofy life simulators for as long as they’ve been around, but I have to admit, I’ve been too intimidated by their size and the density of the overarching story to dive in. 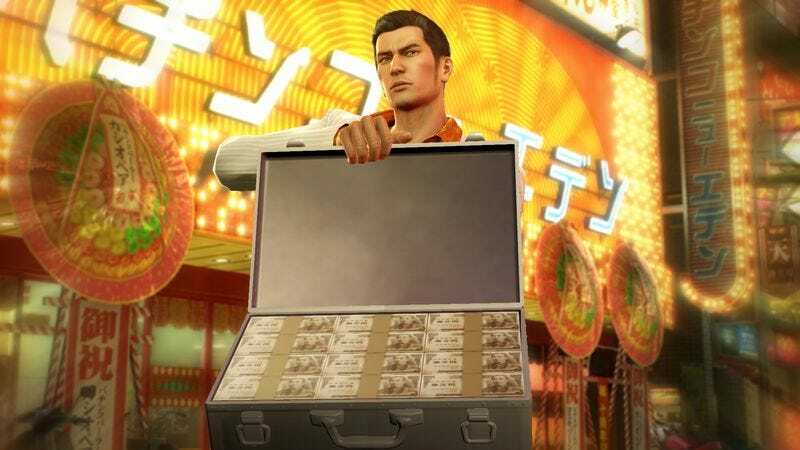 Yakuza 0 being a prequel and origin story that sets up the other six games means it’s largely free of the baggage that’s held back an interested newcomer like myself. Fans have said it’s a perfect jumping on point, and I see no reason not to believe them. So look out, Shinjuku. I’ve got some drunken karaoke to do. Purchase Yakuza 0 here, which helps support The A.V. Club.